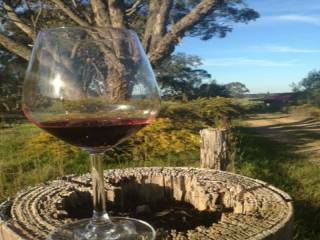 The Cottage is conveniently located on the Pyrenees Highway halfway between the Goldfields town of Maryborough, and the centre of the Pyrenees Wineries, Avoca; and is a 2 hour drive from Melbourne. Ideally situated for that 'get away from it all' weekend. An open plan and comfortable living area comprises lounge with wood heater, eating area and fully equiped gourmet kitchen. A twin bedroom and bathroom complete the ground floor. A full length verandah faces west for views of the Pyrenees ranges, whilst an east facing verandah is perfect for breakfast in the morning sunshine. The Cottage is situated on the top of a hill behind a small Olive Grove within sight of the Highway. Away from the road it slopes down towards the Bet Bet Creek which forms the boundary of the 50 acre property. Situated centrally for exploring the historic goldfield towns of Avoca, Talbot, Dunolly, Majorca and of course Maryborough with its arts and crafts,and antique markets. A short drive through Avoca takes you to the vineyards of the Pyrenees region with its cellar door sales and restaurants.